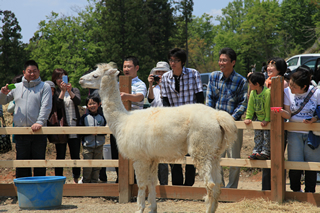 It all began in late March, 2013, with a visit to the Yamakoshi area of Nagaoka City (formerly Yamakoshi Village) to see the reality behind the rumors of an Alpaca ranch there. The snows on the Echigo plains had melted, and the arrival of April would bring with it preparations for rice planting. However, in the Yamakoshi area, in the mountainous part of Nagaoka, snow still lay as deep as 1m in places. 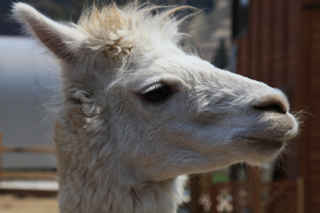 The ranch itself was surrounded by snow, and the alpacas relaxed quietly in their barn. In the attic of the office Mr. Aoki, president of the alpaca ranch, had guided me, I noticed many plastic bags full of alpaca hair. Some of the untouched, dust-covered bags, he told me, had been there for 4 or 5 years. “What a waste,” I thought. “Can’t these be used?” Fast forward, roughly a year later. 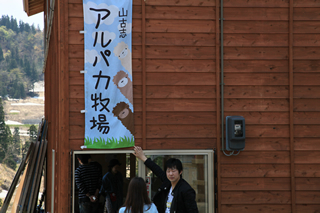 In April, 2014, with the cooperation of a major Japanese knitting manufacturer, we succeeded in producing a sample yarn made from Yamakoshi alpaca wool, the product of trial and error. In June, we used that yarn to make knit goods such as small accessories, invited buyers, and showed them our products. While there is still room for improvement, now is when things will get truly interesting. 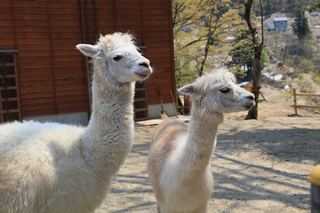 Together with President Aoki, we would like to dedicate ourselves to creating a regionally-based brand of products made with Yamakoshi alpaca wool. This will doubtless help to vitalize Nagaoka and the communities of the Mitsuke area. Copyright(C) Marusho Knit Factory All rights reserved.